These include the amazing Hex N More template from JayBird Quilts. I've been stalking Julie Herman's beautiful quilts for a while now and can't wait to have a go at trying out some of her seemingly easy blocks thanks to this multi-purpose ruler. I also look forward to creating some of my own blocks featuring hexies, triangles and particularly the jewel shape. For so much more on this ruler and Julie's patterns check out her website. I do love the quilts of Faith Jones of Fresh Lemon Quilts, she has a fantastic website that I have spent hours devouring, her patterns are so yummy and her free tutorials inspiring. Go and have a look, you will not be disappointed! Elizabeth Hartman has another of my fav blogs to follow, Oh Fransson! The quilt above left is called Metro Area and is a very modern take on the Sampler Quilt - I love it! Her adorable Fox and Hedgehog block patterns are also on my to-do list, check out her blog for patterns and so much more! The quilt above right is by Shea Henderson of Empty Bobbin Sewing Studio - Shea is new to me, but I do love her half-hexie quilt Parallels - time to get that Hex N More template out! The Modblock book is from a favourite US business of mine, Missouri Star Quilt Co. Their YouTube tutorials are absolutely everywhere I look these days, from Facebook and Twitter to Instagram, and offer short intuitive films on different quilting techniques and quilt designs. 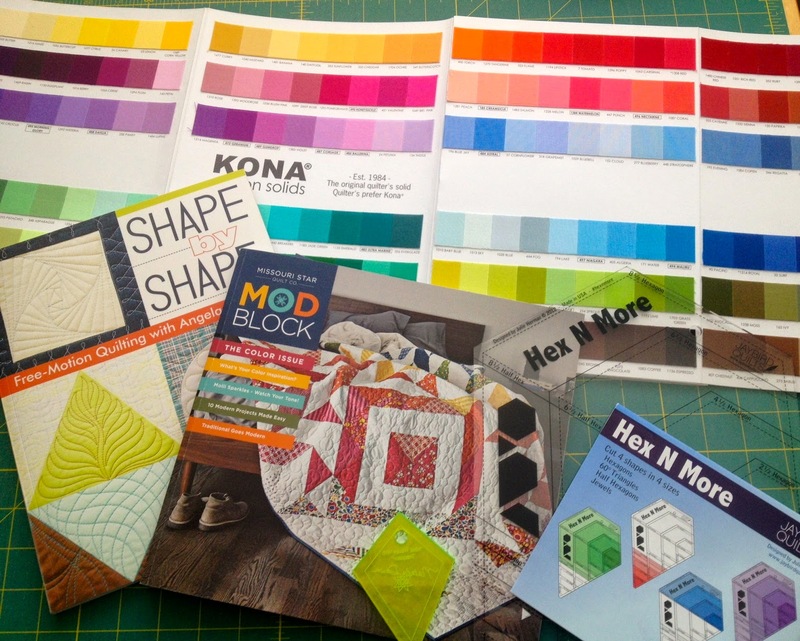 This is their first edition of Modblock which aims to encourage those new to quilting to develop their skills, whether it's in choosing colour and tone - Molli Sparkles' article is very funny and also clearly explains how a variety of tone in your quilt can really bring it to life - to providing inspiration for your next project. As well as interesting articles, there are plenty of quilt patterns, including, yes again, another half-hexie quilt - I can see an obsession coming on! This one is by Lisa Hirsch and uses fusible applique, a definite must try! I also bought that cute "Mini Wacky Web" template from Missouri, I had no idea what to do with it, it just caught my eye! However... I have now found this tutorial on Missouri's YouTube page, and I'm so pleased I bought it! You must watch the film, the foundation method is amazing! Yet another thing to add to the 'must try' list! My last item of stash for this week is the book Shape by Shape by the truly inspiring Angela Walters of Quilting Is My Therapy. Now I know I may have mentioned this lady before, but I do truly find her quilting amazing, and having now bought her book I can't wait to improve my free-motion quilting... if only I had a longarm to work on.... I can dream can't I?! 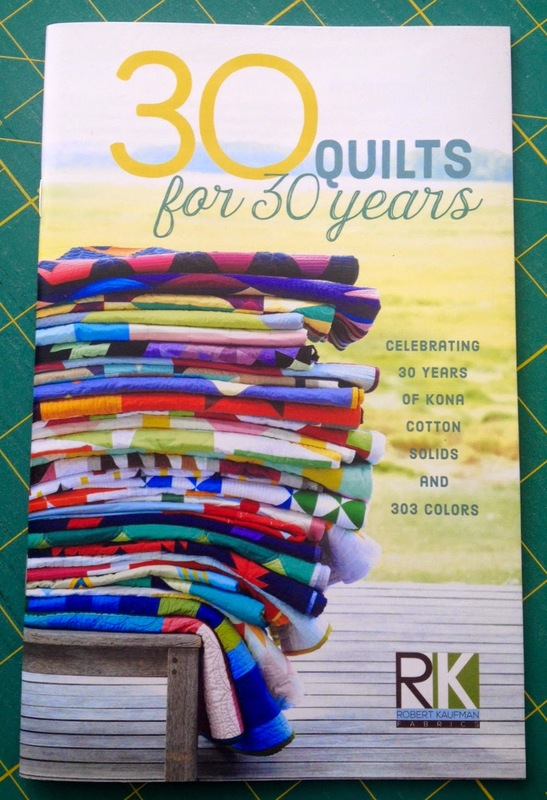 This book concentrates on quilting within geometric shapes, one of Angela's specialities. Each chapter centres on one shape - square, triangle, circle, diamond and hexagon - and features ten different quilt designs for each one, with clearly written instructions and diagrams to help you along the way. 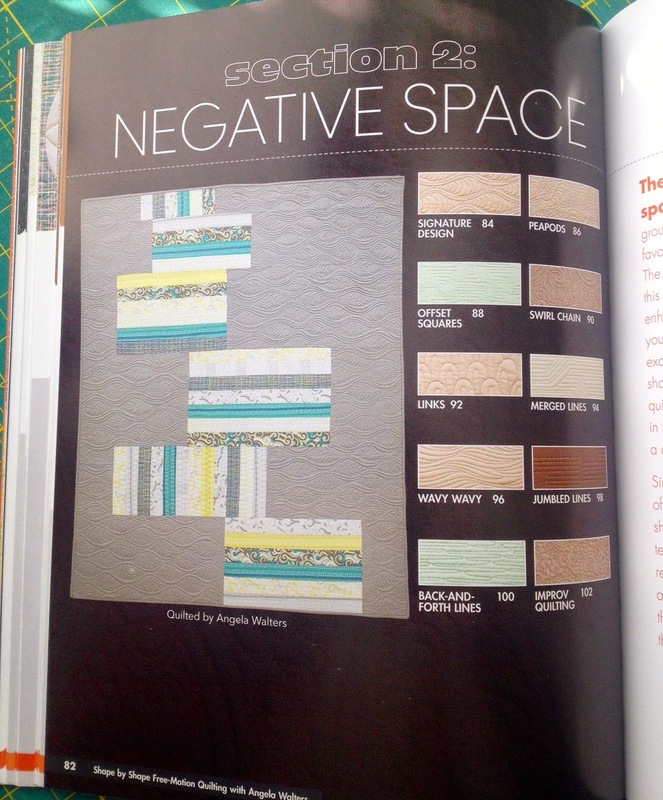 The second two sections of the book feature quilting in the borders as well as another speciality of Angela's, negative space, much of which featured in my favourite quilts from QuiltCon. While creating these quilted patterns would be much quicker and probably a little easier on a longarm, I do feel that, with a little patience, most of them could be accomplished on a domestic machine.. I will let you know how I get on! My final fabric stash from QuiltCon (Haby stash to come soon) includes these gorgeous fat quarters from Cloud 9, an American company who specialise in organic cottons for the home sewist. I loved this stand so much in Austin, I went back for more the following day! I'm not sure what I'm going to do with these yet - can I mix organic cottons with non-organic? Or should I keep them all the same? At least I bought enough that all work together! Incidentally, Cloud 9's beautiful website has some truly inspiring projects including quilts and bags and they're all free! After four days of quilt-show joy in Austin, we thought we would go on a mini road-trip around Texas, starting with a couple of very cold days in San Antonio and a visit to the Alamo. This unassuming old building in the centre of downtown San Antonio is where, in 1836, a small Texan army stood up to over 1,000 Mexican soldiers until, completely outnumbered they finally fell on the third day. The battle so outraged Texan settlers and adventurers from the United States (Texas was actually independent at this time and did not belong to the union) that many joined the Texan army to take on the Mexicans. They went on to defeat the Mexicans at the Battle of San Jacinto which ended the Texas revolution. The town of San Antonio is very pretty, and I imagine even more so in the summer, man it was cold! They have this lovely canal circling the centre of town below road level where you can walk along the pathways lined with restaurants and shops - definitely worth a return visit. We then drove down to Fredericksburg... while we're on about driving, can I just scratch my previous comment about US freeways being easy to navigate... with no road signs until seconds before you turn off, constant toll roads to avoid by driving on perfectly fine roads right next to the tolls, and elevated junctions that put spaghetti junction to shame... we are definitely getting a satnav next time!! Anyway, where was I... lovely Fredericksburg is a town founded by German settlers in 1846 and which still keeps it German traditions today, with schnitzel and Bratwurst on restaurant menus, and inspiring antique shops full of furniture from the 'old country'. On our last day, guess what... I found another quilt shop!! I loved One Quilt Place! Now if I'm ever lucky enough to have my own quilt shop, this is what I would want. I love the quilts hanging from the ceilings - so inspiring! They've also used old pieces of furniture such as that gorgeous bed frame to hold traditional fabric ranges, genius! I especially loved this colourwall of fat quarters, how yummy is that!! My final fabric purchase of my hols was from this amazing shop, they have the best 1930s fabric range! As I'd already spent far too much, I had to control myself and just went with these to add to my stash. In my second Sunday Stash I'm sharing more goodies bought during my wonderful trip to Texas last month for QuiltCon in Austin. I've been loving Carolyn Friedlander's prints for a while now, and was so happy to add these bits to my stash. From her Botanics and Architextures ranges, I think these will work well together... again with some white... to make a simple and fresh quilt – maybe this is the fabric to try out some partial seamed hexagons! While standing in line to pay at one of the stalls at QuiltCon, I happened to spot a leaflet about a quilting shop hop around the local area... as if a 4-day show wasn't enough! So much to my husband's delight (!) we went on a mini road trip and found A Quilter's Folly, a lovely bright shop full of beautiful fabrics. Among these I spotted some favourites, ditsy floral feedsack-type prints, and went a little crazy... again! Having now seen these two collections above toegther, they kind of co-ordinate don't they?! Ahhh, so many ideas, so little time! I do love these mini florals, and don't only use them in quilting. This is my latest T-T-Teessiders cushion and I think the grey flower looks perfect with the pinky-red lettering and light grey background.